Queen of the Clan: Up, Up, and Away! What's that up in the sky? 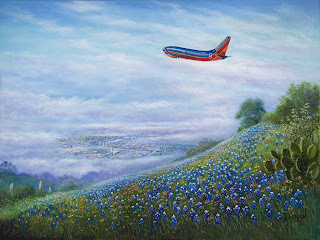 Why, it's a Southwest airplane taking Danyelle and two of her kids to Pennsylvania. That's right, folks! They're zooming through fluffy white clouds, on their way to meet Aunt Cheryl, Uncle Rick, and Ian. But never fear, posts will still appear! Be sure to stop by Saturday for the QOTC review of Passage to Zarahemla, the Movie. Danyelle will return on Monday. Until then, have a great weekend!